Acid-rock is dead. Long live the King. Music enthusiasts in need of a culture-shock after the "comin'-down-off-acid-rock-blues" are turning to Jesus as their musical and spiritual void-filler. Proof was first evidenced in early 1969 with Arlo Guthrie's rendition of "Amazing grace" from his "Alice's Restaurant" soundtrack. Since then almost every big-name in the music industry has made a joyful noise unto the Lord to the tune of instant stardom and a mint of gold records. Friday's concert at Long Beach Wilson High School was free. Sponsored by Maranatha Music, an off-shoot of Cost Mesa's Calvary Chapel, six Jesus-rock groups with an anti-dope message turned the unassuming campus into revival grounds. Audience response was overwhelming. Maranatha first descended on Long Beach two weeks ago for a concert at Millikan High School. Spokesman Frank Pap reported more than 1,000 people were turned away from lack of space in the 1,700-seat auditorium. To accommodate crowds at Friday's program, two simultaneous concerts were staged: one in the school's gymnasium, the other in the auditorium. Performers moved from one location to the other after completing their set. Still, people were refused admittance. Steps outside the auditorium were covered with silent devotees listening for strains of amplified heraldry. Many of the 5,000 seated inside had arrived as early as 6 PM, anticipating a large turnout for the 7:30 PM concert. The four-hour event proved well worth the wait. If the term, "headliner" can be applied to one of six bands which share instruments, amps, compositions and homes, it would probably fit "Love Song's" status. Chuck Girard, formerly of the Hondells, now pianist for Love Song, told the crowd he appreciated the enthusiasm, "but what we're here for is to glorify Jesus." The band started off into a tight lick which introduced a composition of their own, "Country Church." The song explains how most churches today have fallen into mere "religion" and its one-day-a-week rigid doctrines. 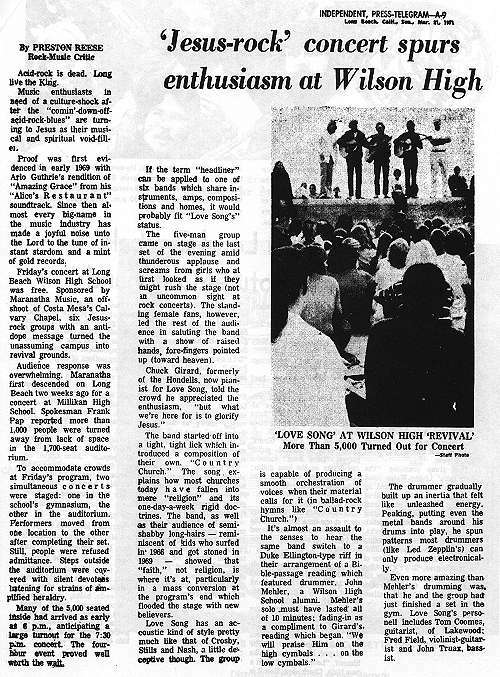 The band, as well as their audience of semi-shabby long-hairs - reminiscent of kids who surfed in 1966 and got stoned in 1969 - showed that "faith," not religion, is where it's at, particularly in a mass conversion at the program's end which flooded the stage with new believers. It's almost an assault to the senses to hear the same band switch to a Duke Ellington-type riff in their arrangement of a Bible-passage reading which featured drummer, John Mehler, a Wilson High alumni. Mehler's solo must have lasted all of 10 minutes; fading in as a compliment to Girard's reading which began, "We will praise Him on the high cymbals....on the low cymbals." The drummer gradually built up an inertia that felt like unleashed energy. Peaking, putting even the metal bands around his drums into play, he spun patterns most drummers (like Led Zeppelin's) can only produce electronically. Even more amazing than Mehler's drumming was that he and the group had just finished a set in the gym. Love Song's personnel includes Tom Coomes, guitarist, of Lakewood; Fred Field, violinist-guitarist and Jay Truax, bassist.